John Peter Zenger lived under a government that did not tolerate criticism from the press. If your newspaper printed articles that made the government look bad, you’d be arrested – and just never mind if you had evidence to prove your claims. Forget it! Truth was no excuse for treasonous behaviour. Can you guess where Zenger lived? Nazi Germany? Post-WWII Poland? The Soviet Union? Nope. John Peter Zenger lived in New York City. In 1733, Zenger was arrested because his newspaper, The New York Weekly Journal, ran articles critical of the colonial governor, William Cosby. Zenger was chucked in prison where he spent eight months waiting for his case to go to court. This was one of those famous and important trials that changes everything. It established that truth was a defense for libel. More importantly, it influenced the First Amendment of the United States Constitution which ensures freedom of the press. Westinghouse Studio One at CBS brought this trial to the small screen in a one-hour teleplay, The Trial of John Peter Zenger. The teleplay originally aired in January, 1951 during National Printing Week. Now, you can’t expect too much when watching an early television program, and 1951 is still pretty early for TV. Characters often seem outlined in black felt pen, or their heads emit a strange white glow. Sometimes a camera suddenly swings towards a character, as though an actor’s line caught a cameraman off guard. Also, you have to expect the sponsor to have the first and last word, with two mini infomercials in between. Eddie Albert plays Zenger, a hard-working man who does what needs to be done and doesn’t care about accolades. He is a law-abiding fellow who is, at first, reluctant to speak against the colonial government. Albert is really good in this role. Even with the aged footage, you can see his conflicted face when considering his moral dilemma. He is loyal to a government who gave him a home when he fled Germany; yet he is a champion of Free Speech. The scenes with Albert and Seldes are wonderful to watch. Their movements are almost choreographed, showing us that this is a couple that has been together – and in love – for many years. Jacques Aubuchon is rather over the top in his portrayal of William Cosby, the colonial governor. Cosby is the opposite of Zenger; he is a vain, cartoonish man who loves publicity and never does anything useful. It is worth noting that this teleplay would have been a not-so-subtle reminder to Cold War audiences that North Americans enjoyed something the Soviet empire did not. And it’s still a reminder today because, as you know, many nations still do not have access to a free press. The Trial of John Peter Zenger may not be a stellar example of early television work. It’s clumsy at times and the third act is excruciatingly preachy. However, the story is compelling and you can’t help but admire Zenger’s courage. 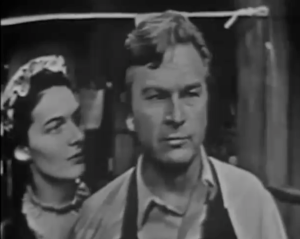 The Trial of John Peter Zenger: starring Eddie Albert, Marian Seldes, Frederic Worlock. Directed by Paul Nickell. Written by Irve Tunick. Columbia Broadcasting System, B&W, 1951, 60 mins. 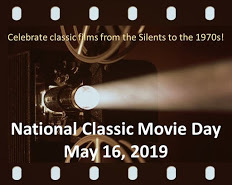 This post is part of The Journalism in Classic Film Blogathon, hosted by the civic-minded Comet Over Hollywood and Lindsay’s Movie Musings. I adore Eddie Albert and have a fascination for early television. Thanks for sharing this find. Some of the supporting cast seem to be unrehearsed, but Eddie Albert really shines. It’s worth watching for him and Seldes alone. Ruth, EDDIE ALBERT: FREEDOM OF THE PRESS sounds quite fascinating and moving! It’s so easy to take Freedom of the Press for granted here in our wonderful country when there are still people around the world who don’t have these rights. 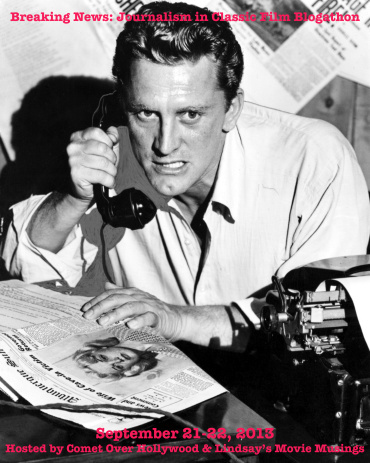 I’m glad you made this your entry in the Journalism in Classic Film Blogathon, my friend; I’ll have to check it out! Thanks, Dor. It’s sobering to think that so many people today still do not have the ability to access a free press/media. But one bright spot is that Iran has just allowed its citizens to access Facebook and Twitter. That is good news! This is such a fascinating story and deserves to be told, even by the newborn TV. Maybe this is available somewhere like the Internet Archive, and you made a great point that this story ressonates perfectly with the Cold War. If you’re able to find it online, it’s worth a look for many reasons…especially if you’re interested in early television. I never heard of this, but it sounds fascinating. I definitely am going to be on the lookout for it. Not too long ago, I would have doubted Eddie Albert’s ability to take on any kind of role other than comedy. (Green Acres had somewhat typecast him in my mind.) However, he very convincingly played a villain in 1958’s The Gun Runners, and since then, I’ve seen him in a new light. I’d like to catch him in this. Ah, yes “The Gun Runners” with Audie Murphy! Still have not seen it, but it would be interesting to see Eddie Albert in another serious role. He was a versatile fellow, no? LOVE the fact you chose a classic TV piece for this! Fantastic idea! Great write-up, Ruth and I’m taking the time to search for this as soon as I can. It really is interesting, Aurora — not just the story but the sheer mileage they got out of only 4-5 sets. Those TV pioneers were a clever bunch. This sounds like a wonderful movie! Sometimes it’s good to right back to the beginning of something, there’s so much you can learn. I’ll certainly look out for this – thanks for sharing! It’s true — when you go back to the beginning of television or movies, there really is a lot a person can learn. Have you been watching “The Story of Film” on TCM? Fascinating stuff, hey? This sounds very interesting, Ruth. I would love to see it. How did you ever find it? Do you have any suggestions where I might locate it? I loved the way you opened your post, having us guess where this took place. I would never have thought it was here in the 1700’s. It is so easy to romanticize the past. I know — it’s shocking to think that such oppression took place on North American soil, isn’t it? Here’s hoping it never happens again. I happen to own this movie, as part of a 1950s DVD collection. The quality isn’t the best, since it hasn’t been given the full digital-remastering treatment, but it’s a great collection of movies and old TV shows. Most of the titles are pretty obscure. Very interesting and thoughtful post. I am sure those McCarthy-ites were not happy with this one. Thanks for some compelling reading, Ruth. Ha — good point! I’m sure the McCarthy-ites were NOT very happy. But fortunately, there was nothing overt in the script that could cause them to block the telecast. An important episode in American journalism, and a terrific example of thoughtful, purposeful television back in the day. Thanks for this illuminating post. I admire television pioneers for creating these kinds of “purposeful” shows, as you said. And it’s nice to see that some networks, like HBO, continue this tradition. This sounds really interesting. I’ve heard the Zenger story story told on a couple of old-time radio shows, but I hope I get a chance to see the TV version some day.